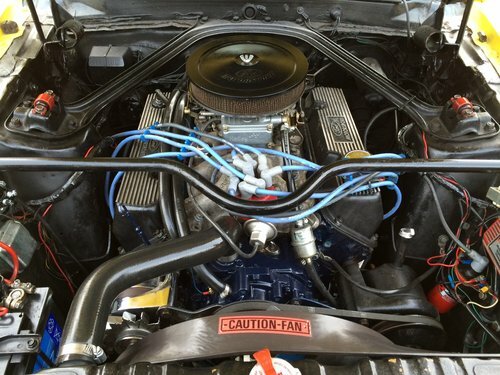 The engine is a 351 Cleveland V8, recently spent almost £4k on the engine and it is a real animal, i'm pretty sure the car has 4.11 gears so it will smoke the rear tyres with little effort, having said that it is more than happy cruising, a lot of money has also been spent on the transmission in the last few years. 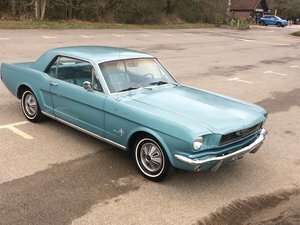 Mileage is 50k, i'm certain this is the original mileage as I have MOT's dating back to the early 1980's which all show mileage. 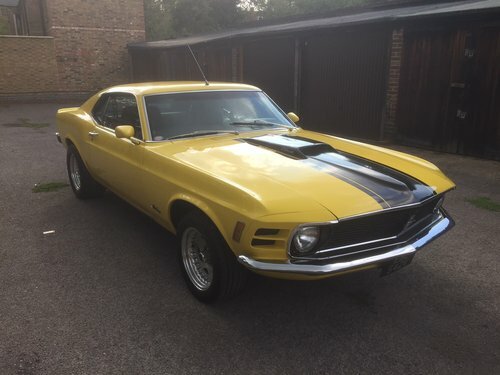 I would be almost sure the engine is original also but I have not checked the numbers to confirm that. 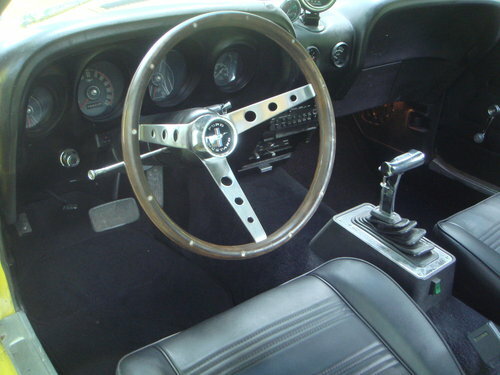 Some of the upgrades to the car are as follows…..
Ford Cobra Jet Cam and steel timing gear. Crane Cams hardened pushrods, guide plates and screw in studs. Comp Cams "Magnum" roller rocker arms. Holley 650cfm vacuum secondary 4 barrel carb. New Autometer water temperature gauge. H pipe exhaust system with cherry bombs, amazing sound. C6 three speed Automatic transmission, shifts perfect with no issues. 15" Centerline Wheels in very good condition. All tyres have excellent tread, recent 2 new tyres. 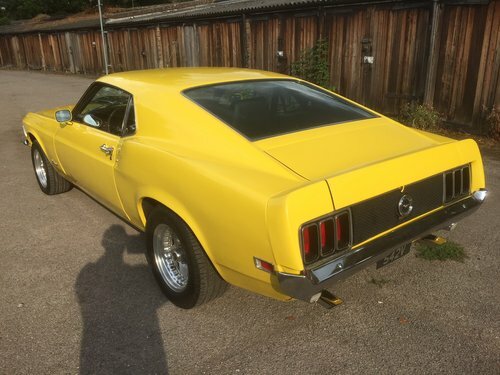 The car is a yellow car from the factory and the paint and bodywork is in excellent condition, I recently just spent some money freshening up some areas on the paintwork so it now looks amazing. Floors and boot area are all solid. 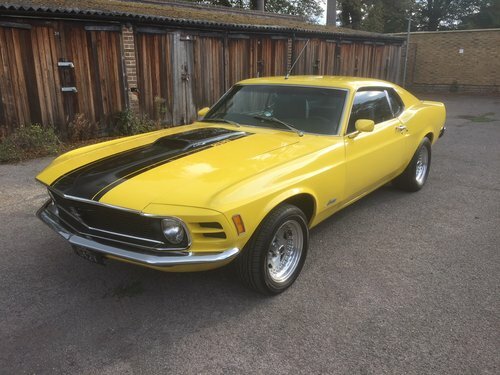 Black interior in very good condition, recently I had the seats professionally re-trimmed in vinyl and it looks great, headlining has a slight split and a slight crack on the dash pad. 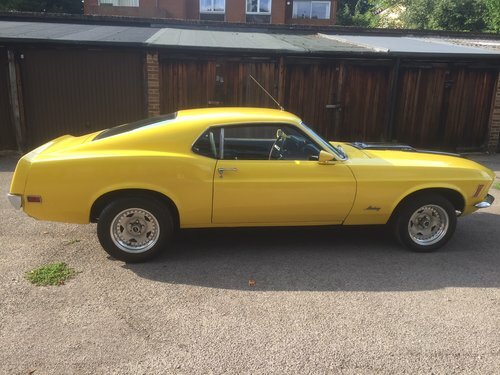 So to conclude this is a really nice Mustang that is ready to enjoy at the car shows, it is not a concourse show queen but is in beautiful all round condition and I think you would struggle to find a better one for this kind of money if you are after this shape. Please Email for a video of the car. Viewings welcome however please only come to view if you are serious about buying it.